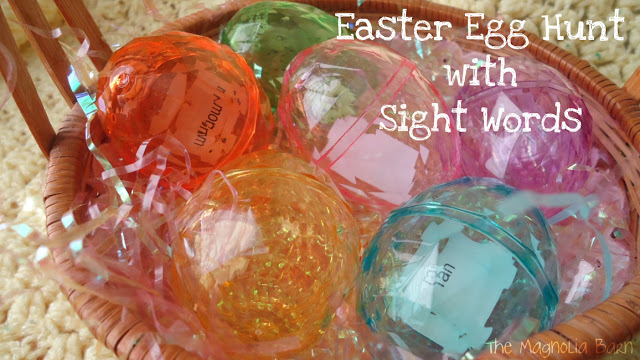 A few weeks ago I began thinking about what activities we could do this year for Easter, especially with regards to sight words. To keep it fun and interesting, I came up with a Sight Word Egg Hunt! We are currently using the You Can Read program from 1+1+1=1. Up to this point, Abby has learned over 60 words ranging from Unit: 1 to Unit: 15. I simply made a table in Microsoft Word with each sight word, printed and cut them out filling each egg. I found these cute Easter Eggs at the Dollar Tree to add to our collection. Now, a fun seasonal activity can be educational for around $1 or less. And, this could easily be changed to include alphabet letters, shapes, numbers, colors, etc.